I really enjoyed this video. Perhaps you will as well. A nice bit of creative editing. As a nerd, I have a really fond place in my heart for discussing works of fiction as if they were real, using logic and analysis to determine probable causes and outcomes to things screenwriters had no idea people would ever discuss -- let alone argue over. Socio-political climates are interesting to me, regardless of whether they, in fact, even exist. Being able to include Transformers and Snorks in such discussions adds a nice bit of entertainment value, and makes depressing topics just that much more manageable. After some discussion I realized that the mohel could simply bring some Kryptonite near Supes' junk, effectively neutralizing the effect of the yellow sun's radiation and allowing for both an easy circumcision and the future harmony with Jewish Lois's family. End of discussion. Anyway, the reason for this roundabout meandering through my conversation topics is so that I can share with you a couple wonderful bits of Star Wars discussion. That stuff will take a considerable amount of reading to wade through for even the most dedicated nerd, but what I'd like to share now is a quick YouTube video. This video brilliantly skewers the Loose Change argument style, putting forth evidence of an equally-compelling nature (i.e. ludicrously ridiculous) to the ones filling the popular internet 9/11 consipiracy film, this time supposing that the Death Star was not ACTUALLY blown up by Luke Skywalker's skilled shot into the ventilation shaft, but rather that it was destroyed by the Empire themselves. 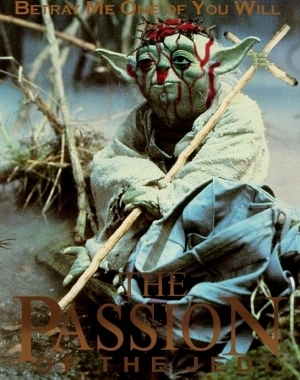 This is a must-see for fans of both Star Wars and Loose Change alike, for it pokes great fun at both. http://youtube.com/watch?v=55nQ00gSKC0. "It's as if millions of childhoods just cried out in anguish, and then were suddenly silenced." 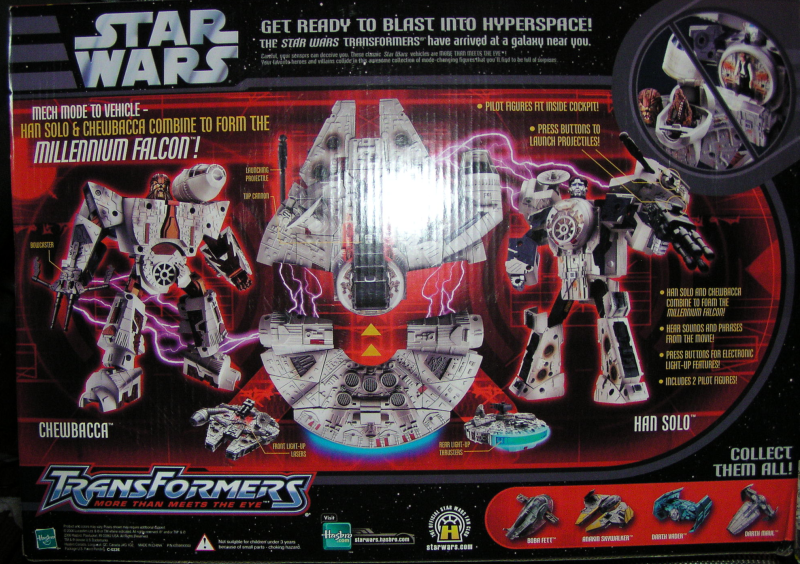 If you grew up on the 80's and/or have any kind of fondness in your heart for either Star Wars or Transformers, I'd strongly urge you to just go ahead and quit reading right now. 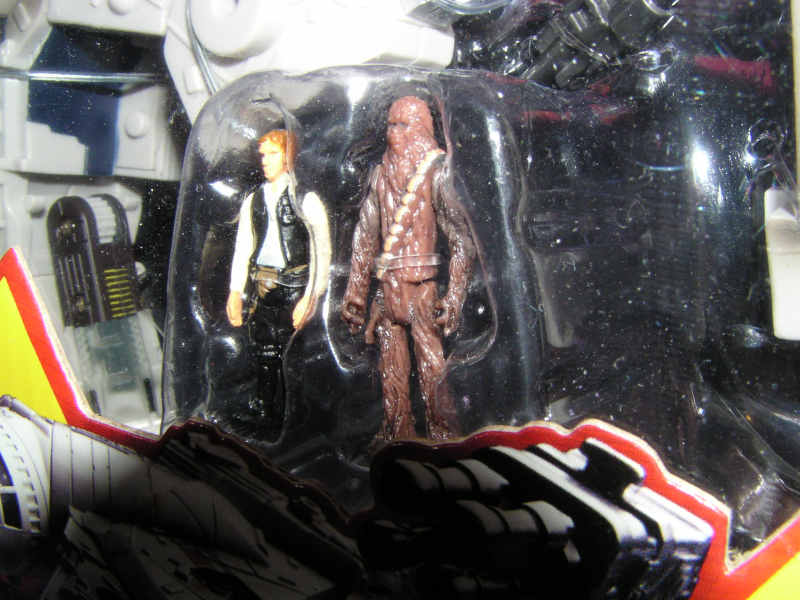 What I'm about to show you, courtesy of my action figure collection, is quite possibly the wrongest toy in existence. I'm not kidding: I can't think of anything more wrong. The following images may disturb sensitive eyes; viewer discretion is advised. I wish I was kidding. 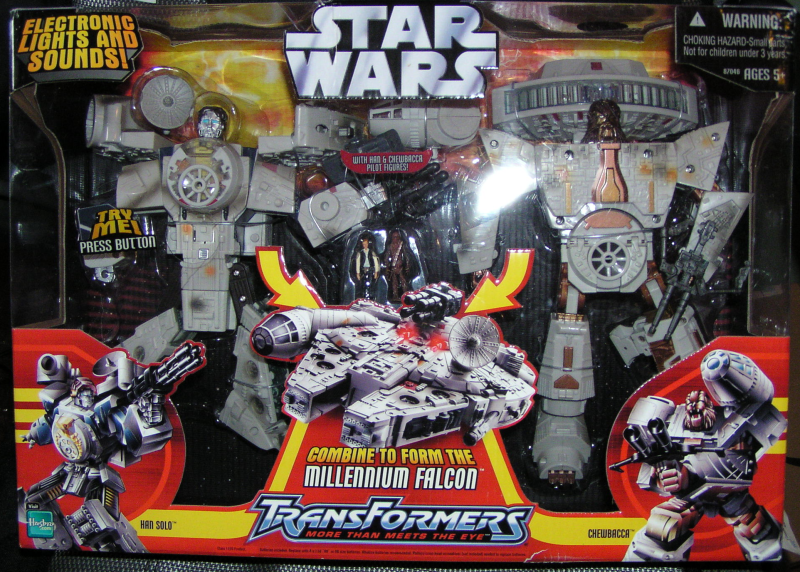 The Millenium Falcon, complete with tiny Han and Chewie figures, transforms into a giant Chewbaca robot and giant Han Solo robot. 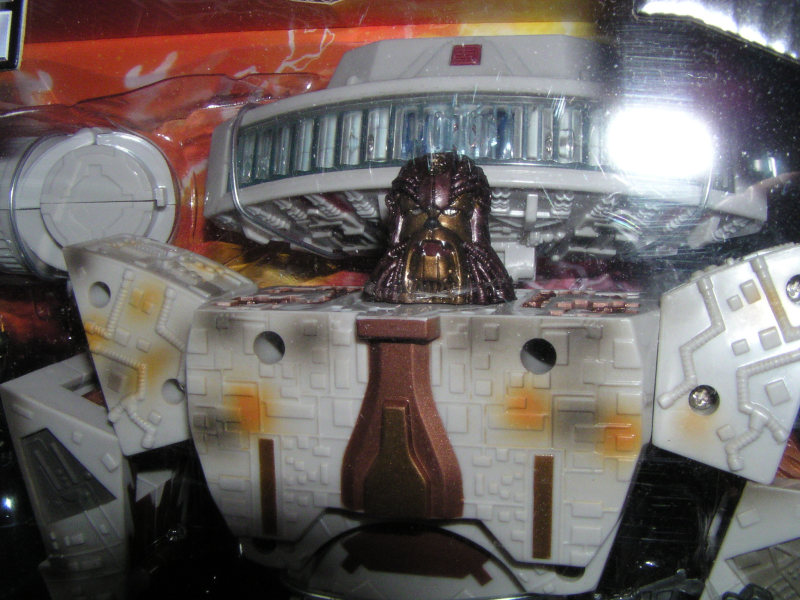 "Transforms into a giant Chewbaca robot" is one of those phrases I could have gone my whole life without saying, but no, Hasbro has forced me to do it. I've had this thing sitting since Christmas, debating whether or not to share it with the world, but decided that I simply had to. 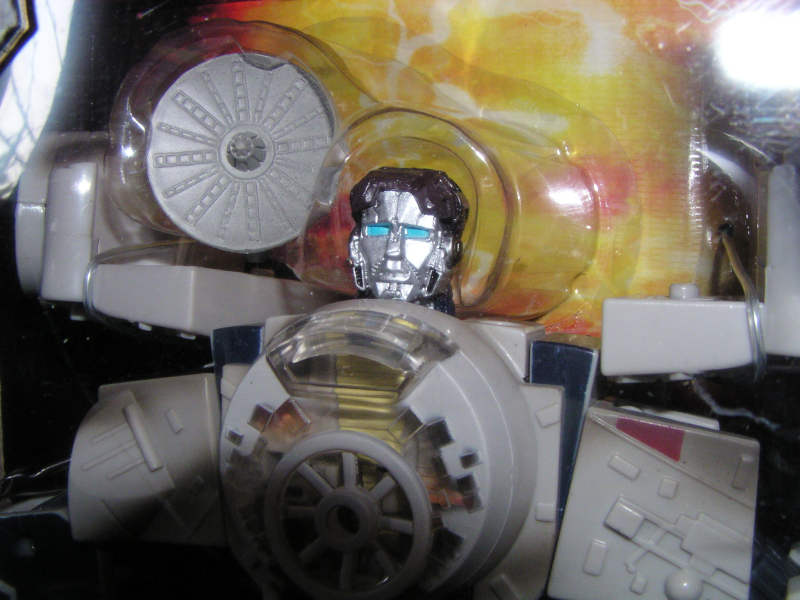 Anguished cries about murdered childhoods ought to be directed to Hasbro, not to me. I'm just the messenger. The very perturbed messenger. One day after a record-shattering weekend for Star Wars, Episode III: Revenge of the Sith, an advocacy group is asking Burger King to stop the tie-in of its Kids Meals with the film because it is rated PG-13. A year after Michael Moore weighed into the 2004 presidential campaign with "Fahrenheit 9/11," both sides of America's partisan divide are debating the political messages of a far different movie -- "Star Wars." Even before it opened in theaters last week, some observers were drawing unflattering parallels between the story of interplanetary treachery in "Star Wars: 'Episode III -- Revenge of the Sith" and the Bush administration's war on terror and its decision to invade Iraq. Police in Springfield, Illinois say a man wearing a Darth Vader mask walked into a movie theater, shoved an employee out of the way and grabbed a bunch of cash. Investigators say the robber didn't display any weapons- not even a light saber. Interestingly enough, I got what appeared to be a spam email telling me to go to that Tool of Satan site late last night -- which I had fully intended to do earlier in the day, but completely forgot. Thanks spammers! I think the group trying to get the Burger King promotion ended has a really good point, one I had not previously thought of. I think part of the problem is that the tie-in was well underway before the movie earned its PG-13 rating from the MPAA, it may be possible that neither party fully expected it and felt it was too late to back out.